The Fox, or "Vulpecula" as it is also called, is a very faint constellation of the northern sky. Recognizable by an open line from the back line of a fox nose to tail. One can almost see the fox "lace" to the hunters. The Fox is located between Swan (top right) and the Arrow (Sagitta, bottom left). None of the stars is brighter than the size class 4, but stretches the starry and bright band of the Milky Way by the fox, which makes it interesting to observe. The Fox therefore contains a number of open clusters, which can be observed relatively easy. Special features in the "Planetary Nebula M 27" and also the open clusters "Collinder 399". The brightest star in the Fox is a red giant called Anser. 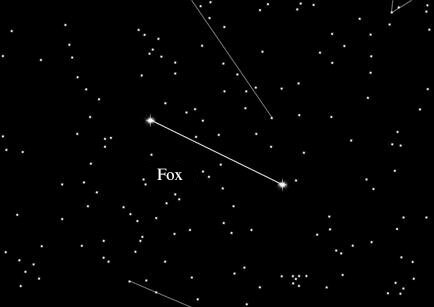 The constellation of the Fox was first classified in 1690, so it is not part of a mythological background. Formerly there was the "Fox and Goose", but the goose is no longer a constellation. Unfortunately, there is no indication of a mythological connection between these two animals. However, they could be connected with the god Zeus, which some other animals in the sky are - as a consolation or final respects to their slaughter in battle. Whether the Fox and the goose are together in a constellation is unknown to us right now, unfortunately.